Appearing for CDL test? Bored studying with DMV Handbook? You are at the right place. 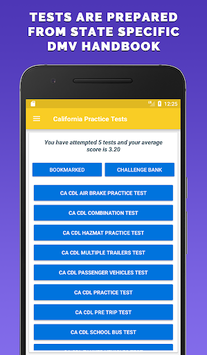 Download this free application for your CDL Practice tests. CDL Practice tests are designed by experts from official state-specific DMV Handbook. Why CDL Practice Test Master? - Question loads with correct answer and explanation. 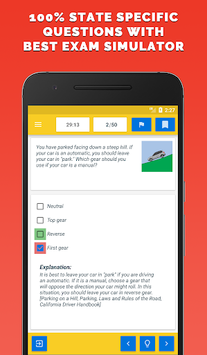 - Helps you to prepare for practice tests. - Similar to real exam simulator. - Skip the question to attempt it later. - Review performance after test. - Bookmark question to revise it later. - Wrong answered question will be added to challenge bank automatically. - Challenge bank questions can be loaded as test to master them. 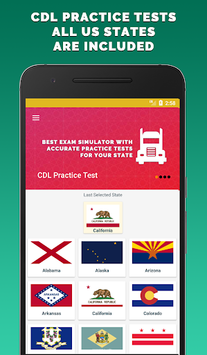 - State specific CDL practice tests for your state. - CDL practice tests are divided in proper sections to prepare well. - Google and Facebook Sign in for quick access. - Keeps you motivated with automated notifications for practice reminder everyday. - Allows to create profile for maintaining detailed performance history. - Get AdFree access for just $3.99 onetime payment. We are not associated with any DMV. This app is not intended to be relied upon in any dispute, claim, action, proceeding or for legal advice. For official law descriptions and administrative centers, please consult the respective state body. It is also highly recommended that new drivers take an approved driver education course to learn the rules and laws of the road, and to develop responsible driving habits.